This year’s Tree for All plant is silky dogwood (Cornus amomum). HCT members are invited to pick up a free seedling on Saturday 4/27 at the Transfer Station from 8:00 – 12:00, and Sunday 4/28 at the Town Green across from the General Store from 9:30 – 12:00. Seedlings will also be available for purchase for $5.00 each while supplies last. A medium-sized shrub of the understory, silky dogwood can grow to be 6 – 10 feet tall, growing a rounded crown and spreading by suckering to form thickets. In the wild it is usually found in or near wetlands and floodplains. It is a great plant for a hedge or border and can also be used as a specimen in naturalized landscapes. 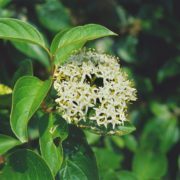 Its tiny yellowish-white flowers in flat-topped clusters usually bloom in late spring to early summer. Flowers give way to attractive berry-like fruit that turn a porcelain-like blue as they mature in late summer. Several bird species are attracted to them. While silky dogwood prefers to grow in moist, partially shaded areas, it is quite adaptable and can grow in sunny areas with less than optimal moisture as well. Photo courtesy of Roland Boutwell.